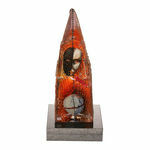 Earth 2-pack, Earth, Bertil Vallien, Kosta Boda - Buy art glass at ArtGlassVista! 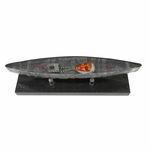 Bertil Vallien is the most internationally celebrated glass artist and designer in Sweden. He’s received numerous awards and his work is represented in museums around the world. He works in a mythical, dream-like world of symbolic imagery. Known as the master of sand moulding, his solid deep-blue ships have become part of modern glass history. His creations include the best-selling range Château.